Stolen Valor in the 6th District? One of the things that has pleased me the most among the candidates for the 6th Congressional District is the strong veteran representation in our candidates (Frank Howard, Christopher Mason, and Delegate David Vogt). I’m a little biased in favor of other veterans, even if they are a jarhead or a zoomie. “But wait, wasn’t Robin Ficker at West Point? Isn’t he a Veteran?” you may be asking me right about….wait for it….now. I do not believe Robin Ficker is a veteran. Below are the facts, and I encourage the readers to make up their own mind. A few weeks ago, I found a series of articles concerning Mr. Ficker and his tenure at West Point. He was expelled from West Point in 1963 for having too many demerits, most of them for speaking abusively to hospital personnel while being treated for a broken leg. Ficker’s first ejection came as a plebe at West Point, where he says he racked up 90 demerits for browbeating hospital aides while he was laid up with a broken leg. “I want more food,” Ficker had demanded. “This is all you get,” he was told. The timeline of Ficker’s West Point ejection has some minor inconsistencies. But one simple fact remains: Robin Ficker was ejected from the Academy. 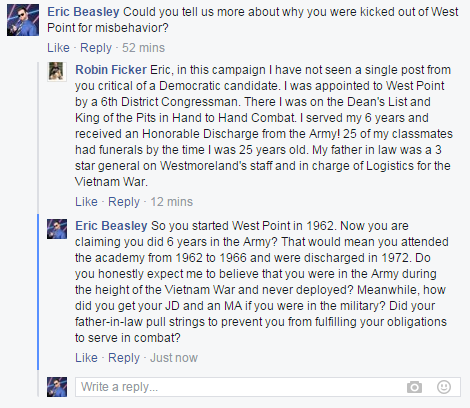 Anybody who knows anything about the military knows that it would be uncommon for an active-duty soldier serving between 1963 (ejection from West Point) and 1969 (“6 years in the Army”) to not deploy to Vietnam. It would also be unlikely for a soldier to somehow receive multiple college degrees during this time period, as Mr. Ficker received a B.S., M.A., and J.D. between his time at West Point and 1973 – when he became a member of the Maryland BAR association. Do the math: Four years for a B.S. Two years for a M.A. Three years for a J.D. That’s nine years of education that was “completed” in a 4 year window, long before online classes. Do the geography: The B.S was completed at the Case Institute of Technology in Cleveland, OH. The M.A was completed at American University in Washington D.C. The J.D. was completed at the University of Pennsylvania in Philadelphia, PA. In the instance of Cleveland and Philadelphia, the nearest Army bases were ammunition factories over 45 miles away. Pretty long hike to make in the late 1960s to take night classes after doing Army training all day. I have been doubting Mr. Ficker’s military service for many months now. I have earned the right to doubt fishy stories of military service. I spent 8 years in uniform. 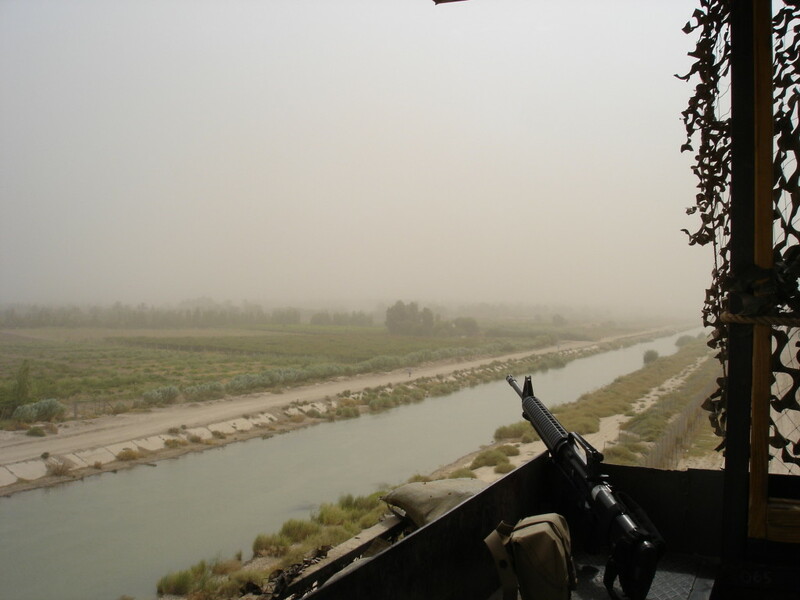 I was deployed to Iraq in 2006. No, I didn’t shoot anyone; I fixed planes and stared at a local vineyard. This is why I have strong reason to believe that Robin Ficker is a fraud and has no place in the 6th Congressional District Republican primary – let alone party politics as a whole. If Robin Ficker thinks illegally placing campaign signs is his biggest problem this cycle, he’s wrong. Candidate Ficker: You are on notice. I encourage you to dispute the facts I presented and prove us all wrong. Show us the DD214. 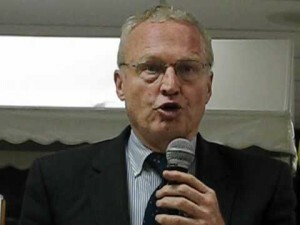 Neil Parrott for Robin Ficker? 1 Comment on "Stolen Valor in the 6th District?" Perhaps he was a reservist during this time period? The response on Facebook seems to imply graduation from West Point – or at the least completion of a 6 year service obligation…. maybe ROTC? Not sure if getting booted from a service academy in the ’60s was a no go for other commissioning opportunities… that said there’s a waiver for everything, particularly if your father-in-law is getting the 3 star to pull strings. I’m definitely curious to hear more – it certainly doesn’t appear straightforward.